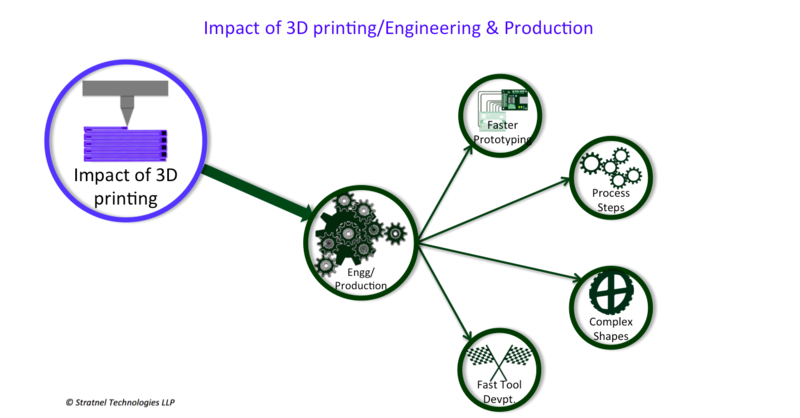 The biggest beneficiary of additive manufacturing is Engineering. It helps in every factor of production. It reduces prototyping time. The product design can handle more complexity. It becomes possible to combine several process steps. This helps the engineering team to put in place radical changes in product design. Traditional prototyping involves making molds and patterns for every prototype revision. Since 3D printing does not have this constraint, prototyping becomes much faster. Design teams can validate design integrity faster. Revisions are not expensive or time-consuming any longer. Product design is not at the mercy of tool makers. There are less delays in project deadlines. Prototyping ceases to be in the critical path. In traditional manufacturing, manufacturability drives design. 3D printing removes this constraint. This enables designers to build in more features into each part. As a result, process steps get reduced. It becomes possible to add several materials in a single product run. This means there is less need for assembly. This reduces cycle time and the need for labour. The product is better integrated and is more stable. The elegance of 3D printing design helps to introduce greater complexity in each part. This helps in reducing assembly costs since several parts get reduced into one. The manufacturing process becomes incredibly versatile. The dependence on many vendors is no longer there. This has a positive impact on lead time and costs. There is an old saying: “Good, cheap, fast – pick any two”. With 3D printing, it is possible to have all three. With 3D printing, it is possible to have production quality moulds and tools in less than two days. It is a totally new way of using additive manufacturing to empower traditional manufacturing.